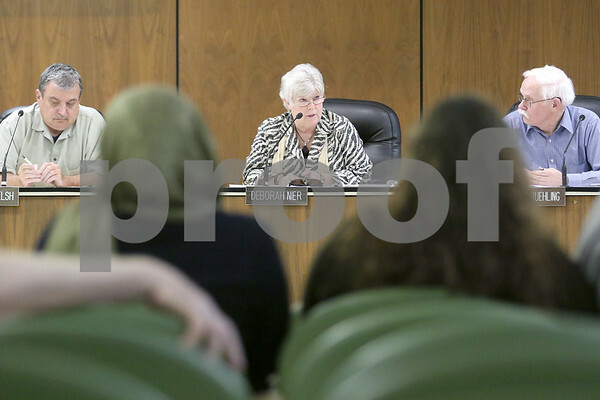 Deborah Nier, with the DeKalb Planning and Zoning Commission, speaks on the agenda of the meeting at the DeKalb Municipal Building on Wednesday, May 13, 2015. The municipal building, at 200 S. First St., is located in a tax increment financing (TIF) district and the city will be able to use about $8.4 million in TIF money to either renovate or rebuild the nearly 50-year-old city hall building. The TIF money will expire in 2018, so the council will have to make a decision about how to allocate that money by December 31, 2018, according to Jennifer Diedrich, economic development coordinator.